Comfortable, traditional, family-friendly villa for a relaxed holiday. Fully equipped kitchen with oven and hob. Air conditioning/heating unit in main double bedroom. Mosquito nets fitted to all windows, fans supplied for summer and heaters for the winter. Open fireplace in spacious lounge/dining room. free English TV and Wifi. 2 bathrooms, one with shower and the other with shower over the bath. BBQ by pool. Ample loungers, umbrellas and patio furniture for pool-side living. Awning fitted over part of upper patio to provide sun/shade versatility. Games room with pool, darts and table tennis for supplement - £30/1 wk - £50/2 wk. 30-minute drive into Benidorm and an hour's drive from Alicante Airport. Within easy walking distance to bank, bars with wi-fi and restaurants, chemist, newsagent, telephones, taxi/exchange, bakery, supermarket, and laundrette. Many sporting activities in the area, including golf, scuba-diving, go-carting, tennis, crazy-golf and fishing. In Moraira there are many shops (including designer), restaurants of many different cuisines, blue-flag beaches, children's fair, weekly market and harbour. As self-employed people running a very small business in England, my husband and myself decided 15 years ago that we would use our savings to buy a villa in the sun, both for ourselves and to rent to holidaymakers to help with the overheads. We enjoyed speaking to prospective clients so much, and ensuring that their holidays were a success, that when we had the chance we bought a small apartment on the beach in Benidorm. We have many clients who return to our properties, and we think of them as old friends even though we have never actually met them. We are very "hands-on" owners, but we cannot praise our staff in Spain enough. Nothing is too much trouble, and Jo and Adam in Moraira, and Shauntelle and Brenden in Benidorm are available close by should any of our clients have a problem. We bought our villa in Moraira because the town itself is very attractive, with so many amenities. It is also easy to reach from Alicante airport along the motorway. It is a great base for extensive sightseeing -there are so many places of interest within a relatively short drive. Valencia and Alicante cities are well worth a visit, and the smaller towns of ALtea with its blue-domed church, Javea with the church designed like a ship, and Denia with the ferry across to Ibiza, all make for an interesting day out. Guadalest and the Fonts d'Algar are a must, likewise Benidorm, a "city on the beach". We chose our villa in the exact spot in Moraira to be close to the bars, banks, supermarkets etc., all within walking distance, yet the villa itself is in a really quiet area. We have tried to make our villa really family-friendly and comfortable. We provide a selection of toys and games for the children, and inflatables for the pool. As the villa itself is completely flat, we feel it is suitable for young and old alike, with plenty of enclosed space so the children can play safely. Jo and Adam, our staff in Moraira, are close by for advice by telephone, or to visit if the problem can't be resolved by phone. There are a real variety of bars and restaurants within walking distance, plus all the essential things like the supermarket, chemist, newsagent etc. Bathroom 1 has bath/shower over, hand basin and wc. Bathroom 2 has shower, hand basin and wc. The wood stove in the lounge provides ample heat and a comfortable atmosphere throughout the villa. Clients to pay for logs, although a "welcome pack" is provided at the start of the stay. We have a fridge with small freezer in the kitchen, and another one in the utility room close to the pool. Larger than normal - 10mx5m with tiled steps into the shallower end - lovely for children and adults to sit and cool down! Notes on accommodation: We would consider pets on an individual basis. Smokers allowed. Suitable for children, as the area is enclosed on all sides. Villa and surrounding grounds on one level, so suitable for the less abled. However, the pool is accessed down a few steps. Welcome packs can be arranged, and we can provide the telephone number of an English speaking local taxi firm. We have English personnel close by to help with queries, problems or emergencies. However, personal holiday insurance is a must. Outside: Private pool 10 metres by 5 metres, with Roman steps into the shallow end just right for the children! The water depth ranges from about 4 ft to 8 ft. Brick-built barbecue next to pool. sun loungers provided, patio tables of varying sizes, and many chairs, so the whole family is catered for. Large patio on villa level, and spacious patio areas surrounding pool. Ample parking space for several cars in villa's own grounds. Gardens and borders are dotted around with tree and greenery providing shade. Pool-side shower to use before bathing. The pool area is not visible from the road, giving privacy. Utility Room: Washer situated in utility room. Ample pegs and washing line provided. Cleaning / Towels / Linen / Maid service: Bedlinen and towels provided, but are not included in the special low price for long winter lets. Villa is cleaned before and after each holiday let. Additional linen change and villa clean are charged extra. Clients to bring own beach/pool towels. Other: Conservatory situated between upper patio and lounge, and which is an especially lovely spot to sit in the winter. There are 2 settees to accommodate 5 people. Many thanks to this client for taking the time to post such a lovely review. I am so pleased they enjoyed their holiday in our villa, and will certainly welcome them back in the future. We had a lovely stay at this villa, it was the first time I had booked through this company and it was very easy, Jenny has put lots of information on the web page and provided excellent directions to find the property, the villa itself was very homely and had a lot of basics you often don't get in some villas. The pool is amazing and very clean and we were lucky to have fabulous weather. The area is really nice, an easy walk into town and plenty of food shops around, a great base for discovering the area if you have a car or if you just want to chill out by the pool. Although on an 'urbanization' it was very quiet and the villa is quite private. I would definitely recommend this villa if you are looking for somewhere to stay around Moraira and wouldn't hesitate to book it again! Myself, husband and four children thoroughly loved this villa. We stayed for 22 nights and didn't want to come home! The villa was made for us....ample room for us all in the villa and in and around the pool. The games room was a bonus and occupied my husband and son when they couldn't stand the sun anymore!! The pool was lovely and big and used the floats provided by the owner to have races...it was kept clean and safe throughout with regular visits from the pool people. The villa was lovely and clean and had loads of little extras in the kitchen which we hadn't thought of bringing with us and we left our little bits we bought for the next user. The villa is close to the centre of Moraira about a 10minute drive and parking isn't a problem. Plenty of restaurants to choose from; a particular favourite was "Munroes" which was excellent value for money and excellent food. There is a local market every Friday which myself and a couple of my children went to every week which we picked up some bargains and a lovely chicken dinner from a stall which cost next to nothing. The villa is a fantactic base for Calpe, Benissa and as well as markets all around that area. Benidorm is around a 50min drive which has Aqualandia and Terra Mitica, again fantastic days out. Would recommend getting a joint deal rather than booking these separately. The owner, Jenny, is excellent to deal with, extremely helpful and happy to oblige when possible. when at the villa there is a list of all people who can be contacted if there are any issues so someone is always there to help if need be. Can't say enough good things about the villa and Jenny. I would recommend a stay here to all and will defo be going back. What a wonderful review! Myself and our people in Spain do everything to make all our clients holidays the best they can be, and comments like these make it all worth while. We like to think our villa is family-friendly, so that everyone can feel at home there, and of course Moraira with its clean beaches, restaurants to suit everyone's pocket and cuisine, shops, market and other amenities is wonderful for people of all ages. Many thanks to this client for taking the time to write such an extensive review - I very much look forward to hearing from you again in the future. So pleased when our clients take the time to post a review, especially such a good one! We try hard to make our villa comfortable and a review like this shows we are getting things right! We have just returned from a winter break and have to say that we had an excellent stay. The villa was perfect for us, comfortable, well equipped, warm - (with the log fire and electric heating) with a beautiful pool and spacious garden and lots of terraces to catch the sun. The weather this January was great during the day, but was often a bit chilly in the evenings which is why having the log fire was so good. The villa is very much 'pet-friendly' with good fencing as well as privacy from the high walls and our dog enjoyed chasing the local cats as well as the short walk to the excellent local bars and shops. The owner Jenny was very communicative, professional and supportive as were her reps on site - Jo and Adam - who could not have been more helpful. We would highly recommend this villa & Moraira. We are always grateful when a satisfied client takes the time to post a review after their stay in our villa. Ourselves, as well as Jo and Adam, put time and effort into making sure our visitors enjoy their holiday as much as possible, and it is lovely to be appreciated. Many thanks. Our stay at the villa was a happy 24 days,our hosts were accommodating with our arrival and departure, and can not praise the couple who manage the house and look after the pool,my two boys enjoyed the freedom of using a pool as much as they wanted and the pool man was extremely friendly and helpful in every way. 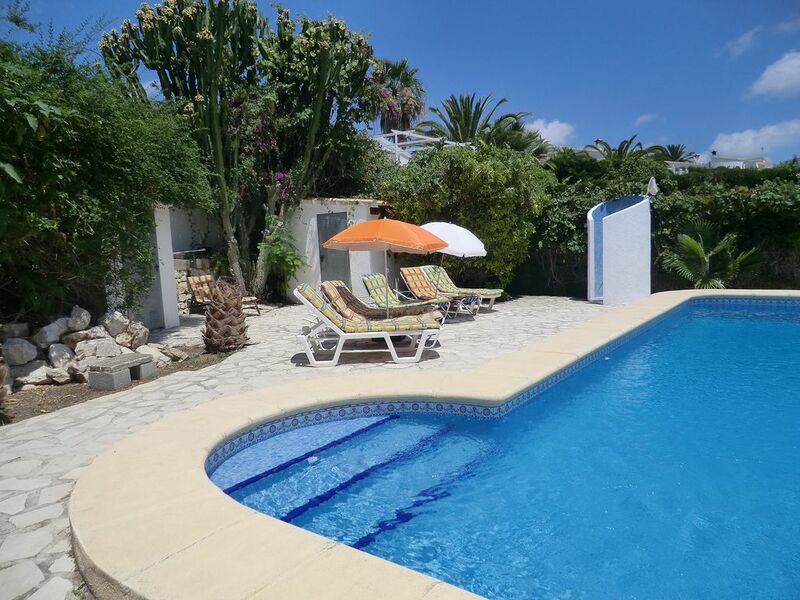 The villa itself is large enough for a large with plenty of space for everyone the garden is large and the pool is probably one of the largest on the estate,the local shop,bar and newsagents were within a 10 min stroll. The property was clean and tidy and had plenty of everything for your holiday. The bonus of having the washing machine and a great area for drying it made the stay all the easier. I'm gutted we cannot book for next year, we as a family thoroughly enjoyed our vacation and would head back there in the future. Moraira itself is 5 mins away or a taxi was roughly 8 euros,where you can find endless cafe and restaurants that go from 10 euro menu of the day up to the amazing D'gust restaurant in the square,The Ni Hao Chinese was excellent value for money to. Many thanks to these clients for taking the time to post such a wonderful review. We love it when our guests have so obviously had a great holiday - that is our aim of course. Jo and Adam, who look after our villa and pool, go above and beyond to make our holidaymakers welcome and comfortable, and it is nice to know their hard work is appreciated. And Moraira is such a charming town, and a good base for sightseeing the many attractions the Costa Blanca offers. So sorry we were already booked for their holiday period next year, but hopefully we will hear from them again in the future. Several blue-flag beaches in area. Nearest is in Moraira, a 10 minute drive away. Also El Portet, just an extra few minutes further on. Beautiful sand for the children, with beach games and play areas also. Moraira with its beach is about a half-hour downhill walk from the villa, and back again would be an extra 15 mins uphill walk! Alicante is the nearest airport, an hour's drive away. Car hire is recommended, but not essential, with "resort-hopper" companies now operating in the area. The cost of a taxi from the airport is approximately £90 each way. Valencia Airport is also about an hour's drive. Murcia is approximately 2 hours away. Moraira is the nearest town, about 1 mile away. Benidorm is about a half-hour's drive. Also within a short drive are Javea, Denia, Calpe, and Altea, all well worth a visit. Guadalest is an absolute must with its stunning views and castle to explore, and the Fonts d'Algar, where you can bathe in pools and waterfalls, are in the same area, all within an hour's drive. On the 'urbanization' itself there are several eating places, ranging from English breakfasts, pizzas and snacks to more up-market restaurants. Within a 5-mile radius there are literally hundred's of eating establishments, of all nationalities and cuisines. There is also a fish-and-chip shop. There is a supermarket on the estate, with other, larger ones within a 10 minute drive. We have a bank close by, with many more in Moraira itself. There is a chemist just a 2 minute drive away, and in Spain the dispensing personnel are more highly trained than in Britain, and can offer advice to save a visit to the doctor. But should an emergency arise, doctors are within a 5-minute drive, and also dentists in Moraira. All the professionals speak English, or have a translator close by. Also on the estate there are 3 friendly English bars with wi-fi, a bar with table tennis and crazy golf and a tennis club with bar. So you don't have to walk far for things to do. There are many bars in Moraira, or you can just go for a stroll as the Spanish do, along the beach, or to the harbour with its expensive yachts, or take the kids to the fair for a treat. For the more active, there is go-carting, scuba diving, canoeing and horse-riding etc There are many fiestas in Moraira, and the Moors and Christians parade early in June is totally spectacular, with a grand firework display later. Benidorm is full of activities, with Aqualandia, a water park for those hot summer days, Cactuslandia close to it full of exotic birds and plants, and Terra Mitica, a huge theme park for all the family. Among the many theme pubs and bars in Benidorm, is Benidorm Palace for that special night out, a truly cosmopolitan experience. If you don't want to drive, taxis are available, or you can book to go by coach. Also in Benidorm is a new shopping mall, La Marina, with designer shops, bowling alley, and cinema with English films on certain days. Booking Notes: PLEASE NOTE - the Spanish government have imposed a 19% "rental" tax, which we have no choice but to charge. This will be on top of the rental price we have quoted. We also have to collect and pass on the passport details of all our clients as they arrive at our property. If we do not do this, it is a possibility that, should our clients suffer an accident while on holiday, the local police will not help because they are not officially in the country. It is also possible that in the event of an accident, the insurance will be invalid. For lets of 3 weeks or more, a deposit of 50% of the total rental is required. For all holidays, the balance is due 3 months before your stay. If paying through Paypal, please mark it "Friends and Family", otherwise a 3% surcharge will be made. Or contact me direct for my details to pay by cheque or bank transfer. Changeover Day: During high season (June to September) change-over day is Saturday, although we can make an exception if convenient. At other times we are flexible. Notes on prices: The above prices are for 6 clients - extra people incur a surcharge of £20 per person per week (the villa sleeps 8). For winter lets of 3 weeks or more the charge for 2 people would be £300 per week - extra clients would be a further £10 per person. There is a one-off surcharge of £100 for villa cleaning after a long winter let.